One of my professors used to say, "don't bring me problems, bring me solutions". I try to live by these words. Thus, what are my solutions to the present ongoing road blockade in Caledonia? The following 8 items are not mutually exclusive, they can be combined for a more effective outcome. 1) A Court Order should be filed against those who set up and maintained the barricade. The OPP knows who these people are and they need to be served immediate "cease and desist" papers. Non - compliance, that is, if they don't completely remove all of the barricade within 3 days, means that they will be served a summons to appear in Court to answer changes of trespass and related charges. Fines should be levied against individuals AND the Haudenosaunee Confederacy Chiefs Council (HCCC) who have bilked solar and wind energy companies out of millions of dollars by pretending that there is a valid Treaty and unsurrendered land and that they are the legal representatives of the Six Nations people. 2) Irrespective of the outcome of number 1 above, the Ontario Provincial Police (OPP) should use their authority and enforce the law, removing the barricade and opening Argyle Street South within 5 days, and in the manner I suggested in the previous blog posting. No muss, no fuss. 3) Local merchants who advertise in the Rez newspapers should read the content of the last two issues and determine whether these media outlets have supported the HCCC barricade. If these merchants have advertising in an "offending" newspaper it should be immediately removed, otherwise they are in effect being enablers to this situation. 4) A boycott of all Six Nations businesses is NOT warranted. There is a lot of disagreement about this blockade within Six Nations, but a survey taken by Two Row Times shows that over 85% of respondents want the barricade removed, and only 15% want it to stay. There is a general recognition that we are all hurting. Six Nations businesses are already suffering. Many sensible people there, as off Rez, see the process as a futile and pathetic approach to problem solving. Click here to see the survey results. Please support Six Nations as well as Caledonia businesses - shop local. 5) The Hydro One tower that was stolen and vandalized (its remnants presently part of the barricade) should be replaced and the wires strung that would link Niagara Falls and the Toronto grid. Billions of dollars have been lost since 2006 when the project ground to a halt. Legal action needs to be taken to recover at least some of the lost revenue. 6) The illegal smoke shops surrounding Caledonia must be permanently removed - in addition to being an eyesore, they are a monument as to how Six Nations believe they can flaunt the law. One law that applies to all people, nothing else is acceptable. 7) All trespassers on the Douglas Creek Estates (DCE aka Kanonhstaton) property should be removed, and the land returned to the Haldimand County Ontario Land Registry system. This property was obtained by fraud since the claim that it was unsurrendered land is patently false. In a previous blog posting I included copies of the original documents signed by 49 Chiefs in Council in 1844 where they specifically surrendered that particular parcel of land. 8) Since the Burtch property was obtained by extortion, it should be returned to the Province of Ontario and then re-established within the Brant County Ontario Land Registry system. There is more, but all in good time. As frustration turns to anger, a class action suit against both the OPP and Six Nations would seem to be looming on the horizon. However, it would seem that the Six Nations Police have to bear some responsibility - apparently DCE is now "Kanonhstaton" and that 40 acre parcel of ill gotten gains beside the blockade is the location through which Six Nations takes refuge and orchestrates action. What responsibility do they bear? Six Nations considers this land to be part of their "territory", even though it was obtained only via extortion, since the land was legally surrendered in 1844 with the signatures of 49 Chiefs appended. Will the Six Nations Police be immune? We will see if a law suit against the Ontario Provincial Police (OPP) for dereliction of duty resulting in the damages caused by Six Nations to for example local businesses, and as well the OPP overtime "necessitated", can be brought to fruition. It may be easier to take the OPP to Court rather than Six Nations. Clearly this is the route the Haldimand County Council appear to be exploring - click here. Court action can be taken against Six Nations (SNEC) and / or individual members. This has been done in the past - successfully in large case tried in Brantford in 2009, and less punishing judgments tried in Cayuga in subsequent years. However, if there was a Court Order to remove the barricade, this would add weight to the proceedings. There are pictures and documentary evidence as to the identity of the "ringleaders" so the OPP know who can be arrested and successfully charged. Pardon those of us who would take some delight knowing that Six Nations Elected Council will probably have to sell the Burtch property just to pay the legal fees for their wayward opponents who are members or supporters of HCCC. Sweet irony. Well, after a much needed pause in the flow of this blog, recent events have made it "necessary" to ramp up and get in gear since the clouds of ignorance and winds of insanity are once again wafting across Caledonia. This current article is NOT about the annual fish fly invasion this year which spiked just before 10 August (see here) with hoards of winged insects covering the roads of Caledonia to the point of necessitating the use of snow shovels to move these odoriferous critters aside. Caledonia is a hot spot for this natural event, but something for etymologists to sort out as to the specific reasons why. However, a rather different sort of recurring invasion happened a day later, one that was entirely preventable, and the timing and duration of which is not quite so predictable. Still, the question boils down to what is it about Caledonia that draws in these unwanted "visits" by troublesome elements? Later in this article I will propose a detailed answer to the unnatural occurrences pertaining to the events of 11 August. Here is a bit of a teaser or spoiler - both visitations are a function of the geography of Caledonia. 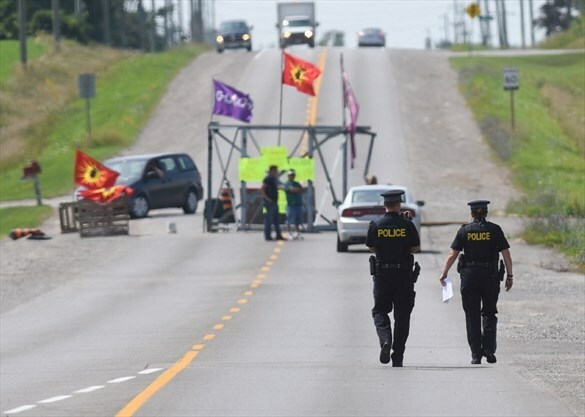 The saga continues: Recent events are described in an article in the Hamilton Spectator of 11 August 2017 entitled, "Indigenous barricade up in Caledonia again". A number of photographs are included. See here for complete article. The above scenes are horribly reminiscent of what was observed in 2006!!! Incredibly, as can be seen in the photos, it is the same Hydro One tower, now very much stubbier and bedraggled, that once again blocks Argyle Street South - more on this later. 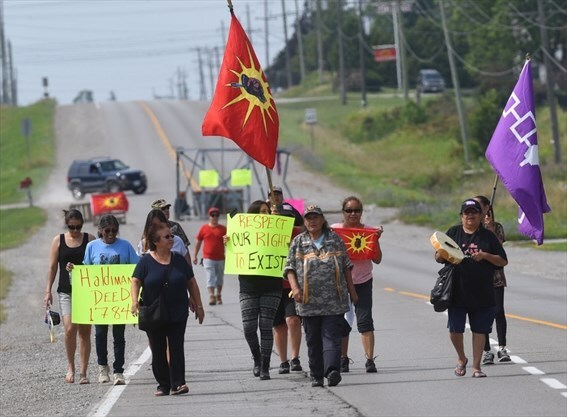 Native protesters who have set up a roadblock in Caledonia again vow to keep the barricade until their demands are met by the Ontario government and the Six Nations Elected Band Council. Doreen Silversmith and a 12-member group of mostly women — supporters of the Six Nations hereditary government known as the Haudenosaunee Confederacy — marched a short distance up Argyle Street South from their blockade Thursday to where OPP cruisers were parked on the road to say so. Reading a statement to reporters, Silversmith said the barricade is a direct consequence of the Ontario government's failure to live up to a negotiated land settlement that led natives to dismantle barricades they set up during an intense occupation of the Douglas Creek Estates housing project in 2006. The new barricade is at the entrance of DCE, which was never been resolved. "The province of Ontario stated in writing that the title to the Burtch lands (in addition to the Caledonia lands) would be returned…," she began. "For this, our barricades in Caledonia … came down in 2006." Then, in April of this year, Ontario passed the Burtch lands near Brantford "not to our Haudenosaunee Confederacy, the traditional government, but to the Six Nations Elected Band Council," which she slammed as "the right arm of the government." "With that action, Ontario has committed fraud and lied to us, to our people." •that "Ontario and Canada return to the negotiating table with our Confederacy;"
•that "Ontario lives by their words of May 17, 2006 and returns the Burtch lands under the Haldimand Proclamation of 1784;"
• that "Six Nations Band Council withdraw their injunction against Kris Hill and the people of Six Nations." The Ontario Government has absolutely no control over the latter, and have already completed the first two "demands". See here for info about the Kris Hill matter presently before the Counts. Furthermore, "Ontario is going to be 100 per cent responsible for any actions resulting from their lies," Silversmith said. An astute question of a reporter is worthy of note: Asked if barricades would also be put up around the Burtch lands, since that is the area in dispute, Silversmith said it is a possibility. When asked why the barricade did not start there, she declined to comment further and returned with the group to the former Douglas Creek Estates site. Why was a major road in Caledonia, NOT a road at Burtch, blockaded? : The reporter above asked an excellent question, which was evaded by the spokesperson for the protesters. I can give an answer though. Burtch was not blockaded because it is in a rural area of Brant County and not near any population center. Thus they would be unable to cause significant disruption and hence be able to bring their point to the attention of others. However a mid sized community in close proximity to the Rez such as Caledonia (which is in Haldimand County) can give them "leverage", and the press would take notice. Furthermore, there are no forward thinking creative thoughts to work with - so in such circumstances perpetrators fall back on the tried and true. So go with a path that is known - "lets block Argyle Street, it has always worked before"! So batten down the hatches, full speed ahead, and innocent victims be damned (they are just collateral damage). Some relevant background including the concept of "factionalism": The decaying and dysfunctional forerunner to the present Haudensaunee Confederacy Chiefs Council (HCCC), the Hereditary Council, which had served the people well in the 18th and first half of the 19th Century, was dismissed upon the repeated requests (pleadings) of the more progressive element at Six Nations. So in 1924 the RCMP (the only police service at Six Nations at the time) locked the doors to the Longhouse. After democratic elections were held, the Six Nations Elected Council (SNEC) was then installed as the legally constituted governing body at Six Nations - and now more could be accomplished in a week than previously in a month (or more) in an increasingly complex world. It is a shame to see so much tradition disappear, but it is a truism that if an institution (in this case one based on lineage) can no longer adequately serve the needs of the community, it must give way to more efficient forms of, in this case, governance - or risk a messy implosion. Here is where factionalism, which has been rampant at Six Nations since the settlement in 1784, once again has reared its ugly head. Instead of accepting the inevitable, and becoming a ceremonial and advisory group working with SNEC, the HCCC has limped along (with major gaps in their ranks, and significant internal divisions) as some sort of shadow government and supporters continue to maintain that they are the ONLY legitimate representatives of the Six Nations people, and assert that the Government (Ontario and Federal - Crown) must negotiate with ONLY them, and that agreements made with SNEC are invalid. The HCCC and supporters would foster a movement backwards in time. For example, they would doom the children living on the Rez to continued welfare and poverty by inserting more "culture and language teaching" in the schools at the expense of maths and sciences. It should be a truism that it is absolutely essential to "move with the times". Alas, even the press have bought into the "back to the past" approach. One of the two Rez newspapers has solidly backed any and all initiatives of the HCCC or their "representatives" since 2006, throwing out the window even the vaguest pretense of objectivity and neutrality, and so cannot be used here as a reliable source. The history of the world teaches us that the only entities which thrive over time are those that adapt to changing circumstances - there is no going back. It does not appear that HCCC has an awareness of any realistic path towards fostering success and still maintaining a useful role in the community - which is sad because it will ensure their ultimate demise. Neither the Provincial nor the Federal Governments can have an effective working relationship with a body where meetings are rare and acrimonious, and where the internal dynamic (e.g., the HDI versus Men's Fire - see previous blogs) ensure that nothing but chaos can be expected. The crisis of 2006: The present "problem" harks back to 2006 when members of Six Nations committed wanton acts of violence and anarchy based on the false belief that the new housing development at Douglas Creek Estates (DCE which they chose to call Kanonhstaton) along Argyle Street (old Highway 6) at the south end of Caledonia was being built on land that had never been surrendered. I have presented the original documents in previous blog postings (e.g., see here) to illustrate that there is absolutely no validity to their claim - but facts have never been bothersome to the radical element who are affiliated with the HCCC. A group of their supporters set up camp on the DCE site, and refused to budge. In a nutshell, when the OPP tried to enforce a Court Order and evict the trespassers, Six Nations people got on the telephone tree and hundreds poured down 5th and 6th Lines (the latter has direct access to the Douglas Creek Estates land). In the melee that followed, and in the anarchy and willful criminal acts of vandalism, terrorism, assault and complete disregard for the law, the various levels of Government and the OPP left Caledonia high and dry - basically cast aside to their own devices. The OPP created a no go zone and the criminals were free to force residents to for example obtain "Haudenosaunee passports" and it was the criminals who regulated all activity in the local area. The criminals were in total charge, and policing was non existent. Among the litany of criminal acts was cutting then dragging a Hydro One high tension tower across Argyle Street - an act that would get any "non - Native" tossed in a paddy wagon an transported to jail. No one ever suffered any consequences for this well documented act of theft and vandalism. At this time the Federal Government (quietly) stood by the formal surrender of 1844, and the Council Minutes signed by all Six Nations Chiefs at the time. These documents are on record in the Indian Affairs Papers at the Library and Archives Canada in Ottawa (and as noted, I have posted original copies to this blog). Various Court cases have upheld these agreements (e.g., Brantford, 2009 as seen in previous blog postings), but that does not mean diddly squat to those who see the world through their narrow preconceived lens. However it was the Ontario Government that was in the unenviable position of having to negotiate with two "governing bodies" at Six Nations who will not even sit in the same room together. So the Government is caught between a rock and a hard place, and although only required to negotiate with SNEC, it offered a seat at the table to HCCC as a courtesy. However when negotiations to find a way to remove the barricades blocking Argyle Street were underway, the HCCC refused to acknowledge any role for SNEC in the proceedings - leaving the negotiators for Ontario (who purchased the Douglas Creek Estates lands from the developers) in a quandry. It is difficult to know what happened next since there are few to no records to consult. Apparently the remaining negotiators (supposedly SNEC members had departed in disgust - which turns out to be incorrect - see below) insisted that the barricades would come down only if the Government agreed to give Six Nations the Burtch Correctional lands in Brant County so that they could be added to the total Reserve. Apparently. The Government gave in to outright extortion, but did what they promised and transferred the Burtch property to a numbered Corporation so that the Six Nations people could, via their legal representatives, access the lands in a legal manner, and proceed to integrate them into IR 40 (Six Nations Reserve). The problem (among many) was that the HCCC adamantly asserted that the lands were theirs (not under SNEC control), and would come under the umbrella of their "government". However, to repeat, the Government of Ontario had no choice but to return it to the "Six Nations people" which meant SNEC (via a registered Corporation) so that efforts could be made to legally add the lands to the Reserve (there was NO other way that this could be done). So months after the initial illegal acts, the barricades were removed and traffic once again moved along Argyle Street - at least for a while until the occasion arose to block Highway 6 on two more occasions, and block the Highway 3 Cayuga Bridge for months - plus of course stopping work on numerous housing developments - but that is another story. Welcome to life in Haldimand and Brant Counties. Meanwhile a Six Nations farmer had been leasing the land from (here it gets fuzzy) to grow corn, tobacco and traditional herbs. However this was not done with the permission of SNEC, so they took legal action against Ms. Hill to have her evicted - thereby inciting the wrath of HCCC since they supported Ms. Hill. This somewhat complex background is necessary before readers review the present "demands" noted the the above newspaper (Spectator) article. How does Caledonia fit into this situation? : Caledonia, Ontario has an unfortunate geographical proximity to the Six Nations Reserve. The fact is that, what is transpiring today has nothing to do with Caledonia, only an internal jousting for power within Six Nations. However the radicals don't consider for a nano second the suffering their actions cause to others since they operate on the principle that the ends justify the means. I want to make this FACT perfectly clear, there has NEVER BEEN ONE SINGLE SOLITARY INDICATOR, PAST OR PRESENT, THAT THESE PEOPLE CARE A WHIT ABOUT THE DAMAGE DONE TO CALEDONIA. I will gladly apologize if I am proved wrong here. The lives of the innocents are quite irrelevant when the perceived "cause" espoused by these aggressors is so "great", and there is no ability to see the broader picture. So now we have to once again witness the manifestations of the power struggle on the Rez, and endure whatever illegal acts are perpetrated (acts that would have local non - Natives jailed in a heartbeat), since the OPP, if history is any indication, will not intervene. The absurdity is embedded in the reality that many at Six Nations have learned to play "the blame game". So, blame the Government (an easy target). So it is Ontario which gets blamed when things inevitably don't go well, even when the facts clearly point to a factional dispute between Six Nations groups. A corollary, or "side effect" is that Caledonia continually gets slapped in the face - why - simply because we are the most geographically convenient pawn in this insipid never ending internal struggle for power at Six Nations. This is all unmitigated insanity - but those of us who are privileged to reside in the beautiful community of Caledonia and surrounds can only shrug our shoulders and say, "what's new" - certainly no creative suggestions from the HCCC supporters have emerged in all these years and there is virtually no chance that any ever will surface. So we await whatever series of crazoid responses will come into play as this oh so familiar scenario is replayed (Mohawk Warrior flags and all). A personal reflection: It should be noted that if some sense deep anger and other negative emotions, it is because those who live here have been forced to endure the fruits of ignorance and a total disrespect for the rule of law on the part of the Six Nations agitators on numerous occasions. A disrespect for the law has spilled over to locals since the OPP have, with few exceptions, acted to protect the interests of the Six Nations protesters with the focus being on sheltering these criminals from the law abiding local people, and fostering politically correct notions of Natives as victims. An objective analysis will show that the only victims here are local people who have to put up with illegal acts (e.g., the smoke shops still on private land at the southern entrance to Caledonia) or risk being labelled "racist". This has the potential to take us all back to 2006 perceptions of the OPP - although this time hopefully they will act in accordance with the principal "to serve and protect" - but .................. So questions emerge such as when will this end, and how much disruption and how many criminal acts we are expected to endure due to the power struggle within Six Nations. This all begs the question, IS THIS HOW NORMAL PEOPLE, SAY IN STONEY CREEK OR WAINFLEET, LIVE? The answer is all too obvious to those of us who live in Caledonia. Locals know all too well what to expect in a location where there is a two tiered policing system - one for "Natives", and another for "non - Natives", with the system favouring the former. Meanwhile the local Federal MP, and the Federal Government, are quiet as church mice - deja - vu - 2006 all over again. Back to the fish fly analogy. Experience teaches us that simply by waiting a few days the fish fly problem will resolve itself via the natural course of nature. However experience also teaches us that with the HCCC they will use Caledonia to meet their ends for as long as they can get away with it. What a stressful, and dare I say bizarre, way to live! The lifestyle and sophistication of places such as Port Dover beckon - but Port Dover is not home. My ancestors have lived on the banks of the Grand River since 1784, and I refuse to be pushed out by thugs and common criminals from Upriver whose ancestors have also lived on the banks of the Grand River since 1784. This just in: Click here to see the article, Ontario made too many 'wrong mistakes', now Caledonia's barricades are back, in the National Post by Christie Blatchford (she having played a pivotal role in exposing the suffering, the cover up and the double standard in policing after 2006 in her excellent 2010 book, "Helpless: Caledonia's Nightmare of Fear and Anarchy and How the Law Failed All of Us"). An update can be found in the next blog posting.